Hand-ties or Working directly into Vox. Both these methods are used in floral studios. Both methods work well, your choice. After creating your bouquet, measure the stems against the Vox you are using. Cut your stems to length & angle trim if required. 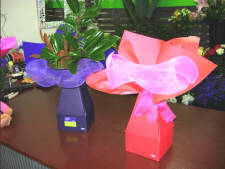 If you have used mesh, tulle or similar fabric, simply arrange it around the base of your flowers. Attach your delivery card here, if you wish. Finish off with your bow of choice. 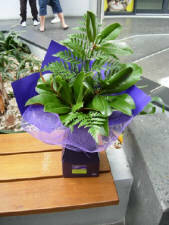 Simply create a base using greenery and place your flowers into your Vox as you would a vase. All of the below flowers have been designed directly into Vox. You can...also, easily attach mesh, tulle or similar fabric for a different style. "Vox is a huge part of our business. 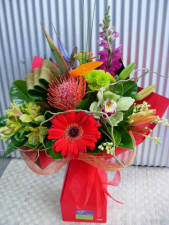 We have the satifaction of knowing our flowers are delivered fresh and look great. We can do so much with Vox".